Don't miss our Little Manila After School Program Open House where our students will share what they learned and their talents as we honor our graduating seniors. We are incredibly proud of our students and their spirit helps to fuel our efforts. Come and be inspired by our students' enthusiasm for our history and heritage. 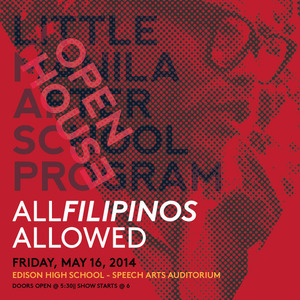 It's on Friday, May 16th at Edison High School's Speech Arts Auditorium (1425 S Center St. in Stockton). Doors open at 5:30pm and the show starts at 6pm. The event is free (but donations to support the program are gladly accepted). If you can't come, but would like to donate to our ongoing efforts to educate the youth of our community, please click here.